Rare oversized map of Washington D.C. showing Telegraph Lines. 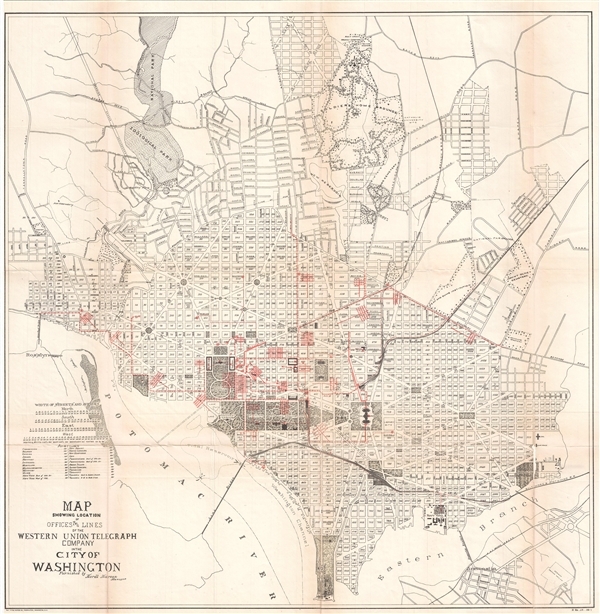 Map Showing Location of Offices and Lines of the Western Union Telegraph Company in the City of Washington. A fascinating 1891 map of Washington D.C. illustrating Western Union Telegraph lines and office. This large map covers from the Rock Creek Cemetery to Haines Point and from Georgetown to the Anacostia River. City Blocks are identified numerically. The map has been overprinted in red to illustrate Western Union Telegraph Lines and offices, information provided by Morell Marean, manager of Western Union. The map is part of a series printed by the Norris Peters Company of Washington D. C. to illustrate a report to the Commissioners of the District of Columbia. This map appears to be quite rare. We have been able to identify only one other example held in the archives of George Washington University. Norris Peters (c. 1834 – July 15, 1889) was a Washington D.C. based photo-lithographer active in the late 18th and early 19th century whom Scientific American called 'one of Washington's most eccentric and mysterious figures.' Peters was born and educated in Pennsylvania. He relocated as a young man to Washington D.C. where he took work as an examiner for the United States Patent Office. During his work with the patent office he became fascinated with the emergent process of photolithography. In 1869 Peters secured substantial venture capital of about 100,000 USD from an unknown investor and founded The Norris Peters Company at 458 Pennsylvania Avenue. Their printing offices have been described as 'unequaled in this or any other country.' From these office Peters pioneered development of American photo-lithography. For nearly a generation he held a near monopoly on government photo-lithographic printing. Among their more notable contracts included numerous maps for congressional reports, maps of the U.S. Coast Survey, maps of the U.S. Geological Survey, Mexican currency for the State of Chihuahua, and the Official Gazette of the Patent Office. Peters also maintained an interesting social life and was a confidant to many of the most powerful figures in congress. He was also a bon vivant known for being an excellent cook and hosting lavish dinners the invitations to which were 'never declined'. Despite being socially active he never married and died a confirmed bachelor. Following Peters' death in 1889 his business was taken over by Henry Van Arsdale Parsell who administered it until his own death in 1901. The company then merged with Webb & Borcorselski, another D.C. lithography firm, and was renamed Webb & Borcorselski-Norris Peters. They continued to publish under this name well into the mid 20th century. Good. Professionally flattened and backed with archival tissue. Narrow left margin. Some discoloration and repaired damage along original fold lines.